Building performance is an important yet surprisingly complex concept. This book presents a comprehensive and systematic overview of the subject. It provides a working definition of building performance, and an in-depth discussion of the role building performance plays throughout the building life cycle. The book also explores the perspectives of various stakeholders, the functions of buildings, performance requirements, performance quantification (both predicted and measured), criteria for success, and the challenges of using performance analysis in practice. Building Performance Analysis starts by introducing the subject of building performance: its key terms, definitions, history, and challenges. It then develops a theoretical foundation for the subject, explores the complexity of performance assessment, and the way that performance analysis impacts on actual buildings. In doing so, it attempts to answer the following questions: What is building performance? How can building performance be measured and analyzed? How does the analysis of building performance guide the improvement of buildings? And what can the building domain learn from the way performance is handled in other disciplines? Building Performance Analysis will appeal to the building science community, both from industry and academia. It specifically targets advanced students in architectural engineering, building services design, building performance simulation and similar fields who hold an interest in ensuring that buildings meet the needs of their stakeholders. 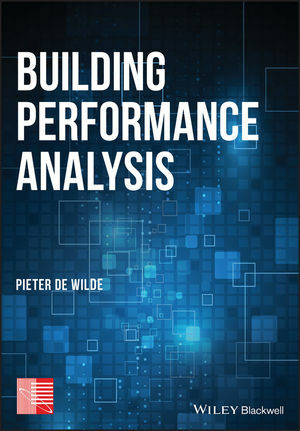 PIETER DE WILDE is Professor of Building Performance Analysis at Plymouth University, UK. His research interests are the design, construction and operation of buildings that perform as expected by all stakeholders. Educated at TU Delft in the Netherlands, he has over 20 years of experience with research projects that involve both building performance simulation and building monitoring. He serves on the Board of the International Building Performance Simulation Association (IBPSA) and the European Group for Intelligent Computing in Engineering (EG-ICE). Professor de Wilde is Fellow of IBPSA and CIBSE, and member of ASHRAE.